Night cream for normal to combination skin that targets fine lines, revitalizes, and tones. Apply to clean face and neck each evening. Wake up to smooth, toned skin, even when you’re not getting your beauty sleep. After 30. Nourishing anti-aging night moisturizer for normal to combination skin smoothes skin while you sleep. 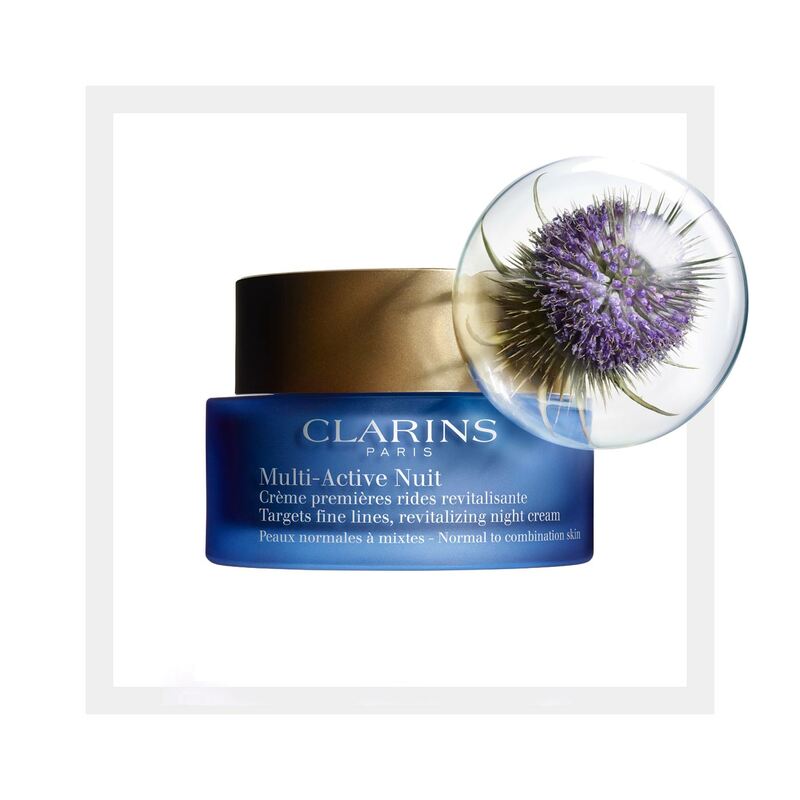 Encapsulated Teasel extract delivers targeted revitalizing and line-fighting action to where your skin needs it most. Organic California Poppy extract helps absorb the visible effects of late nights and interrupted sleep—so skin looks toned, rested and refreshed by morning. Formulated with Clarins' Anti-Pollution Complex to help fight the effects of pollution and free radicals. Targets fine lines and wrinkles. Apply after cleansing and toning. Warm a small amount between your palms. Apply with light pressing motions, working from the center of the face outward. Refreshing eye contour cream that targets fine lines, revives, and brightens. Multi-tasking day cream that targets fine lines, boosts radiance, and tones. Multi-tasking day cream-gel for normal to combination skin that targets fine lines, boosts radiance, and tones. Rated 1 out of 5 by Christy84 from Broke Out I typically buy the non SPF version of this, which I absolutely love along with all of my other Clarins products. I accidentally ordered this because I was in a hurry the day I placed the order but when it arrived I figured I would give it a try. Unfortunately when using this I produce more oil than I typically do throughout the day, which I could live with. What I couldn't live with was it breaking me out. I tried it on three separate occasions to make sure it was the culprit and each time I broke out the same day I wore it. Since Clarins doesn't accept returns on opened product this jar will have to go in the trash. All I can do is post this review for others who may have the same skin type. For reference, I have combination skin that I consider somewhat sensitive. Rated 5 out of 5 by Msbucks from Multi active day- normal or combination I had originally tried the multi active day spf 20 for all skin types, which I found to cause my already oily skin to be very shiny/feel greasy under my makeup after a few hours. I then tried to multi active day for Normal to combination skin cream-gel, and it made all the difference. Both are extremely moisturing, and make my skin feel fabulous, but the cream-gel dries about matte and does not make me oily or shiny throughout the day. Nice light floral scent which doesn’t bother me, it is just fabulous. If you’re not oily I would go for the one with spf, but if you’re at all greasy the normal/combo cream-gel is the way to go. Rated 5 out of 5 by Nancois from Classic to age beautifully There is a vast difference between skin care products. My skin is my canvas & the foundation to the way my face is presented. I'm 47 and find this combined with the double serum provides the right nourishment to make my skin glow! Rated 5 out of 5 by meljay1 from Amazing daily moisturizer Feels so light on my face and noticed my skin was noticeably softer in a few days. Great for every day. Rated 5 out of 5 by Nika007 from Great Light-way day cream I have been using Clarins from time to time. I like to try other product but coming back to Clarins. The Multi-Active Day Cream-Gel is ideal for a combination skin as I have. It is light-way cream, absorbs well and does not make skin feel greasy. Will try Multi-Active Day with SPF this time. Hope it will work as well. Rated 4 out of 5 by Mary M from Great product - RE-DESIGN BOTTLE, please!!! I enjoy using this lotion and feel like it hydrates my skin without making me oily. Also love that it has SPF. The one thing i hate is the product design! WHY does a face lotion not come in a bottle that you can squeeze or pump it out like every other face product on the website?! It is so inconvenient and I just can't understand. Clarins - PLEASE make this in a bottle form! !